With the EAFF Cup starting tonight, I thought I'd include a light behind-the-scenes peek at the Japan National Team staff. 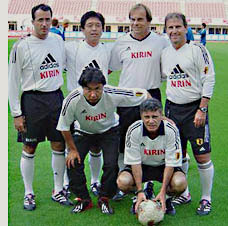 Zico has aimed to create a family-like atmosphere in the Japan National Team. For that, he has surrounded himself with a staff of specialists who have a long relationship with Zico as well as each other. Eduardo "Edu" Antunes Coimbra is the technical consultant for the team and Zico's older brother. An ex-footballer having played in clubs like Flamengo, America and Vasco, Edu's coaching career includes gigs with the Iraqi, Mexican, Peruvian national teams. He's also had opportunities both playing and coaching for the Brazil Selecao. Having received his visa a day earlier than expected, Nakamura speeded up his departure and left for Scotland on Thursday. Reports say he was greeted by some 300 Japanese and Celtic fans and journalists at the airport. At Narita, he commented "I'd like to first take some time getting to know my teammates; what kind of players each of them is, what kind of offensive style and tactics they use. Then build up my own fitness and condition. Little by little..."
In response to questions regarding Celtic's 5-0 loss in the CL qualifying round game, a BBC Sport article quoted him as saying: "People should have no doubt that I am still coming to Glasgow," he said. "European football is not the only reason I will be signing for Celtic. But, if Bratislava can win 5-0 at home, I am sure Celtic can too." "The main reason I am coming to Celtic is to help them become Scottish champions again and, if there is European football, that will be a bonus." The main news in Europe is not that Kashima beat Manchester United, but that there was a "bust up" between Van Nistelrooy and Ferdinand. The four day Chiba training camp ended yesterday, and the Japan National Team hopped a short flight to Korea today. With injury problems and obligations to play in various club friendlies against visiting European clubs, Zico has been so far denied the time to see all 23 members in training together. Only 12 of the 23 players were able to mark perfect attendance int his week's camp. Newest call-up Komano from Sanfecce was added on Thursday, so he was unable to meet up with the team in Narita airport and instead will head to Korea from Hiroshima island directly. The team is in a rather unfinished (and unprepared?) state, but their task is to get the trophy. With so many new variables and lack of preparation time, I cannot tell you exactly what kind of team will show up to the first game against North Korea. I wrote in an earlier entry the news that Nigeria hired ex-Japan NT manager Philippe Troussier to take over their squad. But apparently the Frenchman is planning to undergo surgery on his leg/knee and has declined the offer. The French Ligue 1 is gearing up for the start of their league games. Le Mans' Daisuke Matsui, having helped his team climb out of the division two, is expected to start in the first round home game against Champions Lyons on the 31st. He spent the break period at his old nest Kyoto Purple Sanga taking care of the sprain to his right ankle and building up his fitness. Le Mans have changed almost half their roster since last season. Today was the last day of the National Team training camp. They played a practice game against the Kashima Antlers Youth team, and won 10-0. The game consisted of 30 minute halfs. Missing were the 5 Jubilo players (Fukunishi, Kawaguchi, Tanaka, Murai, Chano) and the two Antlers players (Ogasawara, Motoyama). With their two offensive midfielders missing, Zico played a 3-4-3 system -- or more like a 3-4-1-2. With the 1 being Tamada and the 2 being T.Tanaka and Oguro. The second half, Zico tested out the 4-back defense. All four forwards, including brand brand new member Maki, scored two goals each. This team is continuing to morph and morph again. Now it's right side Atsu Miura who had to leave the team -- he injured his left calf muscle. In his place, Yuichi Komano from Sanfrecce Hiroshima will join the team tomorrow as they depart for Korea. I've mentioned Komano pretty much every time I talk about Sanfrecce, so you all know he was on the top of my list. He has a relatively muscular frame and I've been seeing some good crosses from him this season, though I haven't watched him much recently. Komano played right side during the Athens Olympics, and ended up injuring his collarbone during the games. 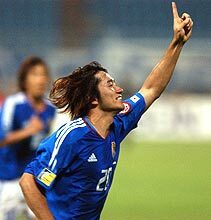 He was later called up by Zico for a charity game between the Zico Dream Team and Niigata Albirex, to collect money for the Niigata earthquake aftermath. The Dream Team consisted primarily of veterans of the JLeague, but Komano was one of I think two players who were in their early twenties. I'm happy he got the call-up from Zico. The papers today showed comments from Yuichiro Maki, who got the call up yesterday. He said that he was out with friends and had not been paying attention to his cellphone. When he did look at the display, he saw how many calls he got from the club GM, and his first reaction was that he had done something wrong and was in trouble. But it turned out to be happy news, and he rushed off to join the squad. He said that there is so much more for him to learn and improve, that it never occured to him that he would get called. He said that it's an honor and all he'll do is put his best performance forward. Unlike some of the other new members who were showing some nervousness in the first couple days, Maki said that since there were a number of players he knew it wasn't that weird. His father is a coach for an ice hockey team, and Maki used to play ice hockey as well as football in school. He plays physical football, and has gotten into a bunch of crashes -- his recurring injuries to his face ended with bone damaging the nerves in his cheek. I'm sad to hear about Atsu Miura, as he's been keeping a great attitude despite not being able to make the starting roster on the squad through these years -- his profile at Vissel has risen, now being Captain and playing multiple roles for his club. His contributions behind the scenes to the national team have been great, and it would have been good for this young team to have someone like him in their midst. So, suddenly it feels like a completely different team, doesn't it? The important thing is for all these new members to play and practice with enough impact that they will leave a strong impression in Zico's mind and challenge the more experienced NT members in their positions. This will inevitably lead to better performances from whoever ends up on the pitch. Luckily many of the new members were part of the Olympics squad (Moniwa, Konno, Abe, T.Tanaka, Komano) so they will have some understanding of the pressure of international games. By the way, this is a bit of old news, but I never really mentioned it before. Japan is planning on putting together a Japan B Squad after the final qualifier against Iran is played on August 17th. The JFA will organize friendlies for the B squad to play, to gain experience at the international level. So many of the newer callups on the NT right now will have to fight to stay on the A squad -- if they don't they will have an opportunity to get more international experience on the B squad. The B squad will consist of younger players (in the early twenties and under) who are thought of as the next wave of Japan's future. I don't think the details have been hammered out yet, like who will coach, etc. I'm not even sure how the JFA will convince other countries to come and play a B team...financial incentives, I guess. The B squad is a between-Youth-and-NT-generation squad -- is the best way to define it. Maybe we should call it the Gap Squad. Kashima Antlers played Manchester United tonight. I missed a bit of the beginning but it was an intersting game to watch. There was so much of a media blitz about Real Madrid this week that the other teams (like ManU, Bayern, Bolton) were sort of cast in the shadow. But watching the match, it is obvious that ManU have an overwhelming roster -- I think in many ways much more exciting than Real...though I'm sure some of you may disagree. Did anyone catch the game? I guess you were all at work, so maybe you'll catch replay or delayed broadcast. The first half was a much more focused game from Kashima -- their team concept was clear and it worked. ManU took a little time to get used to the game. Masashi Motoyama and Mitsuo Ogasawara ducked out of their national team training to rejoin their club for this game -- and it turned out to be a great decision. Motoyama score both goals: the first at minute 4, when he found himself with the ball past the defense on the left side of the goal. He didn't hesitate and just shot the ball in with his left foot at an angle. His second goal at 24 mins was almost the same kind of shot. Ogasawara took little time to flick the ball to Motoyama again on the left side of the goal. He took a nice swing from almost the same angle as the first goal. It was a nice performance from the two internationals. ManU's goal at 7 minutes came from Giggs who caught up to a nice low cross from the right to direct the ball in at the far post. They created some other rather perfect chances, the most memorable one in the second half after Van Nistelrooy and Park had subbed in -- Van Nistelrooy opened to the right and heeled the ball back to the center for Park, who was right in front of the goal unmarked. Unfortunately for the visitors, his shot went over the bar. The Kashima supporters were out in full force, and I heard a bunch of chants that I haven't heard during the season in a long time. The funniest moment of the evening was the one phrase I heard loud and clear through the tv microphones on the side of the pitch -- when (I think) Rooney's voice was suddenly soaring through my speakers saying "Ah, you **cker". It was a heated match, with a number of jostling incidents and accidents. ManU's problem was that they let Kashima get the lead -- rather than trying to "entertain" the audience, Kashima played to win, which to be honest I prefer to see...a serious match where the teams aren't there to pat each other on the back with smiles all round but to play serious football. Kashima are often belittled by the great J community because they can respond to the necessities of the game as it unfolds. Kashima played relatively poorly in the second half -- they didn't have the same focus as they did in the first half, and were saved by ManU's mistakes. They did make a number of shots, a few from mid-range. ManU didn't quite have the creativity they needed to break down Kashima's wall until Van Nistelrooy entered. Also it was fun to see Rooney out there in the second half, and he took one of his great canonball shots but the ball went a little wide to the right. Wouldn't we just kill to have someone with his power in Japan? The post game interviews of Ogasawara (who accepted the trophy as captain) and Motoyama (who was Man of the Match, and exchanged jerseys with Rio Ferdinand) were also funny. Ogasawara must have taken a course or two in the Kubo School of How to Respond Without Emotion to Excited Interviewer questions. He had very short and played-down answers -- reserved and focused on the job done rather than any excitement over winning against a famous club. Motoyama was his usual light-tempoed self, answering questions with schoolboy goodness, "Yes, I was happy about the goal", "Supporters, domo arigato gozaimasu! ", and didn't forget to bop his head in small bows left and right. It's so strange to see these two contrasting personalities work so well together on the pitch. Meanwhile, FC Tokyo played Bayern and lost 0-4. Not a surprisng result as all of their top players are either at the NT training camp or injured. I'm not even sure who they ended up playing on the Tokyo squad. It was poor timing to lose everyone like they did, and I'm starting to get recurring nightmares about FC Tokyo's downward spiral... I really can't go through that again! I guess it was a good thing I wasn't able to catch this game live..?! Kawasaki Frontale hosted Bolton, and the game ended in a 1-1 draw. Have not seen any of this game either. Fiorentina beat Cerezo Osaka 3-0 tonight. Hidetoshi Nakata started for his side, despite the injury worries to his knee. Will Shunsuke look good in green (and white stripes)? The Celtic website >>Clickis already gearing up for the tsunami of Japanese fans bombarding their site -- they've announced a Japanese version of the site will become available shortly. And they've even started planning for a, what else?, Japan Tour next year. Meanwhile, the man himself is cooling his heels in Japan waiting for his visa to come through. When it does, he will immediately head for Scotland. And with him a ton of stuff, apparently -- his kit of goodies, equipment, things that he needs to stay healthy and fit. He's even taking his personal trainer with him, I hear. Now that they have lost Nakamura, there are rumors that Reggina are looking at Takashi Fukunishi...hmmmm. Fiorentina have arrived in Japan and are preparing for their games against Cerezo Osaka, Sanfrecce Hiroshima and Tokyo Verdy. Hide Nakata hurt his left knee last week, and was saying he wanted to take care of it first, but Fio would like him of course to make an appearance in the three games. Meanwhile, the future of Atsushi Yanagisawa remains in question -- his club Messina got kicked out of Serie A for financial reasons, and though they are appealing, it doesn't look great. There are rumors that the club may end up letting go of Yanagisawa. I have very little info on this, so don't quote me, and let me know if you hear further news. Poor Yana, he may never get that elusive Italian goal...! I did speculate >>Click to read my previous post, and hey, I actually included him in my choices! Jef Chiba's 24 yr old 184 cm Forward Seiichiro Maki joined the NT today. 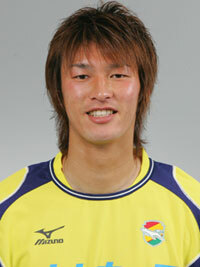 He joined Jef in 2003 after playing at Komazawa University. Maki replaces Marinos forward Kubo who backed out because he ended up going ahead with an injection of some sort of drugs for his back/knee problem on Monday. Zico apparently was upset that Marinos had gone ahead with the injection after he played quite actively for his club this past week (albeit limited time) -- the drugs would basically mean he wouldn't be able to play for another couple weeks. There seems to be a bit of misunderstanding of some kind going on here. Zico took Marinos and Kubo's decision as their way of safekeeping Kubo from having to play on the NT. I think he is taking their reluctance as lack of enthusiasm for the national team. Marinos of course, took exception to this claim, saying that they had scheduled the injection ahead of the roster announcement. I guess there are two things at work here. Do you remember when Feyenoord put up a snit because "all they got was a fax" when Shinji Ono was called up ahead of the Iran and Bahrain qualifiers? Well, in the end it all got smoothed out with one simple phone call from the JFA. Basically, the Japanese thinking is that if the proper form is filled out and sent at the proper time, that's enough. The official seal is on the paper, and everything should run smoothly. But I guess what Feyenoord, and in this case Zico, wanted was a tiny personal touch. Especially in Zico's case, since this is the second time Marinos withdrew Kubo from an NT callup. And I think all Zico would have liked was a phone call or message, saying "thanks for the call up, I really want to play for the country, but hey this injury is acting up again and I'd like to take care of it now". Zico likes to call up his "regular" team, even if they are carrying injuries but are at enough fitness to play, because I think he wants to see the player for himself and have time to talk with them about how things are going. If he sees that the injury will not allow him to play, then he doesn't play or he is sent home. Feyenoord were a little ticked that Ono keeps coming back from his international games with injury, so I guess they just wanted a little TLC. Zico didn't show disapproval when Yanagisawa talked with him about withdrawing from the squad ahead of the Asia Cup last year, though it did take a while to get back on the roster...but that could involve other reasons than his withdrawal. In the end, Marinos are in the right. They had their reasons, and Zico/JFA have to accept that. The JFA don't have any problems with Marinos, so it's basically Zico's reaction that Marinos/Kubo is not respecting the process of an NT call-up. It's also interesting how the clubs have prioritized the NT as well. Zico actually told the Jubilo players that they should stay with their club and play the friendly against Real Madrid, that it would be a better experience for them in lieu of the NT training. Vissel's Atsu Miura joined the NT today after his team's friendly against Bolton. And tomorrow/Thursday, the Kashima players will duck back to their team to play against Manchester United, and rejoin the NT as they depart for Korea on Friday. But FCTokyo, who will be playing against Bayern Munchen tomorrow (Thursday), have said that the NT is more important and have not asked for their players back (there are 4 FC Tokyo players on the NT right now, and it's not like FC Tokyo has any other top level players except Ishikawa; in fact, I think Tokyo just announced Ishikawa, Toda, Kanazawa, Jan, and Lucas are all injured). I guess they figure with Konno and Moniwa still unused to the NT atmosphere and desperate to cement their position with the team, it was prioritized. Speaking of the newbies, the Japanese media is having a field day gossiping about them. Especially FC Tokyo's Konno and Urawa Reds' Tanaka. These two are battling nerves, trying to get used to being on the NT. Tanaka is known for asking a lot of questions -- how do you do this, what do you do next, when do we do that? Konno was apparently finding it hard to relax the first couple days -- all those "famous" players, he commented doesn't know what to say. The other players are trying in their own way to make the new guys feel more comfortable; luckily, it's a very relaxed team that knows how to have fun and when to get down to business. Konno fans can rest assured, he's getting settled now that we are in day three: people like Doi, Moniwa, Nakazawa and Oguro usually are the ones creating a good mood through tough NT trainings and games. Yesterday was GK Doi's birthday, and he got the traditional Brazilian flour-and-egg ambush. As for training, it sounds like Tanaka is showing some good hustle and finishes. Oguro and Tamada are doing well too -- the team did a game format training this afternoon, and these two were the chosen forwards for the starter team. Maki arrived in time for the afternoon practice, and I'm looking forward to seeing whether the speedy run-hard Jef philosophy will prove him effective in this team. Konno and Moniwa were also singled out by the media as showing gutsy tough attitude in training. Zico is spending a lot of time on goal-scoring -- he is especially keen on getting the players good and tired, and then making them shoot for goals. The reasoning behind this is to train the players to be able to focus and finish properly even when their bodies and minds are exhausted. He has been telling them to think, focus and relax before the shot. I'll do a profile piece on some of the general characteristics of Zico Japan's training camps. I also thought it would be a good time to introduce the coaching staff as well, for those of you wondering who else besides Zico is involved in shaping the NT. Sorry, everyone. I couldn't make it to the National Team training today on time. (They are training in Ibaragi prefecture today, and tomorrow.) It was like a four hour plus trip, and by the time I left I realized I probably wouldn't make it before the team left. I'm really sorry. CNN didn't forget to sandwich in a mention of the Toda/Beckham spitting incident, but the focus of their Play of the Day was Taku Yamada's low header goal, the third for Verdy in their game against Real Madrid. "How did he get his head that low?" was their comment. I have to say, I loved this goal too. It was a speedy low cross placed perfectly just outside the right lower corner of the goal. Being so low, you'd expect the player to use his foot/leg, but Yamada fell to it with his head. Hopefully, Verdy will be continue to play with this much energy and focus in the remaining league games. As I was browsing at the bookstore, the title of the Keiji Tamada interview article in the current issue of Football Nippon >>click for FN site caught my eye: "Why is it me? Why isn't it me?"